On October 11, 2008, Arthur Matheson, a full time farmer who owned about 900 acres of farmland in Eastern Ontario. His land abutted a public road. He used an uninsured ATV to get around his property. While on his property, he technically didn’t need and insurance on the ATV. Mr. Matheson needed such a vehicle to maintain all 900 acres of land. That would be a lot of walking. That day, farmer Matheson was out checking the sheep. He was out driving on the public roadway with his ATV. The drive was just down road to connect to another part of his farm on a smoother surface. The drive was only about 90 yards or so. While out driving, just for a few moments a truck driven by Mr. Lewis and owned by GMAC Leasco Limited struck Mr. Matheson. As a result of the collision, Mr. Matheson sustained multiple orthopaedic injuries, along with a brain injury. It was a terrible collision, and the injuries to Mr. Matheson were very serious. The Defendant, Mr. Lewis fled the scene of the accident. He was later found, and charged with careless driving, obstruction of justice and breach of probation. Mr. Matheson, while he was driving without insurance, was NOT charged under the Compulsory Automobile Insurance Act because the police officer found that the ATV was a “self-propelled implement of husbandry“; and thus, exempt from the CAIA. The police officer was being nice to Farmer Matheson. As it turns out, the ATV was in fact NOT a “self propelled implement of husbandry” and that it would require insurance if Mr. Matheson drove that vehicle off of his property. Despite any other Act, a person is not entitled in an action in Ontario to recover any loss or damage from bodily injury or death arising directly or indirectly from the use or operation of an automobile if, at the time of the incident, the person was contravening subsection 2 (1) of the Compulsory Automobile Insurance Act in respect of that automobile. How cruel is the law for poor Farmer Matheson! What a terrible turn of events. If you’re interested in reading more about this very harsh decision, you can take a read at the Court of Appeal’s decision here. This Court of Appeal decision made my blood boil on so many levels. Here’s a totally innocent farmer who gets creamed by a guy in a truck on a country road. The at fault driver flees the scene, and is later charged with 3 offenses. This farmer likely had his own car insurance, along with property insurance. You would think that one of these sources of insurance would have him covered. You would also think that the at fault driver’s car insurer would be on the hook to compensate Farmer Matheson for his damages for pain and suffering. But no. Thanks to a legal technicality, the at fault driver’s insurer doesn’t have to pay a dime for this accident; and Farmer Matheson’s accident benefit claim is also thrown out. Talk about a hard day for poor Farmer Matheson. I don’t want to see the same happen to any of my readers. 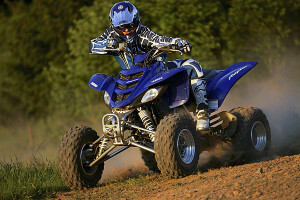 Insure those ATVs, recreational vehicles and snowmobiles. If you don’t insure them, you may not be covered; even if the accident isn’t your fault. Think about the case I just shared with you. This poor farmer was hit through no fault of his own on a country road. He did NOTHING WRONG. He sustained very serious personal injuries. The highest level Court in Ontario told him that he could NOT SUE THE AT FAULT DRIVER OR COLLECT ACCIDENT BENEFITS because his ATV was NOT INSURED. It was because of a legal technicality that this poor injured accident victim got ZERO in his case. If that doesn’t upset, anger or worry you, then clearly we get excited and angry about different things. Don’t let the same thing that happened to Farmer Matheson happen to you. Get covered. Get insurance. It doesn’t matter who you get it with; just get insured. Most cases where Plaintiffs/accident victims get shut out are on coverage claims where defendant insurers escape liability based on a legal technicality such as the one described in the case above. Enough law talk? Sure. How about Toronto’s basketball team! When was the last time you saw the starting line up SIT for the entire fourth quarter because they had the game in hand. I’ve been so impressed by their play. These past two season of Toronto basketball have been some of the best we’ve seen in the city. I hope they keep rolling on. Was it just me or did those purple throw back jerseys bring a big smile to your face? I LOVED seeing them again. Brought back a lot of memories (both good and bad). It’s nice that the team is trying to promote their short, and not so great history. But, it’s still really nice.